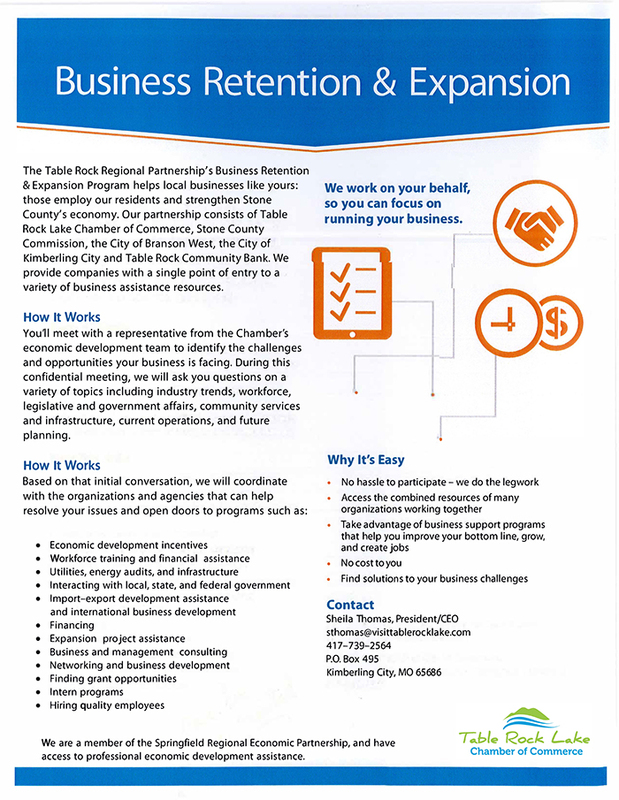 Stone County is pleased to have one of the most progressive tax abatements for new businesses in Missouri. New manufacturing plants and multi-state corporate headquarters are afforded the opportunity to apply for a 75% abatement for 15 years. 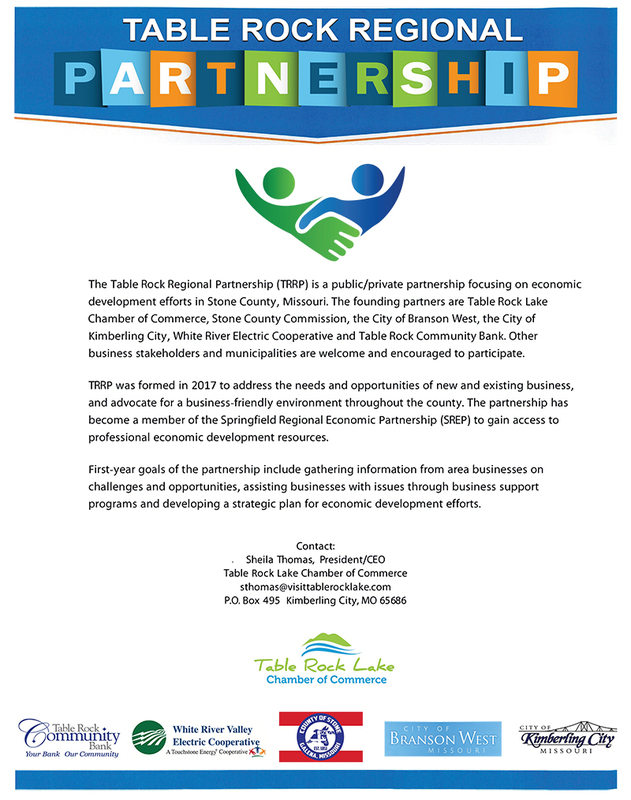 Low cost work force, serenity and clean ecology of the Ozarks and Table Rock Lake make Stone County an ideal location to establish an enterprise or relocate headquarters. Nearby attractions at Branson, new commercial airfields and world class medical facilities in Springfield insure this region will continue to grow into the 21st century. Provision of 50% of employee health insurance plan Abatements above 75% are possible with greater capital expense or number of new employees. The Reeds Spring School District is located in southwest Missouri, near Branson, the popular tourist destination. Students in our district come from Reeds Spring, Branson West, Kimberling City, and Cape Fair. There are approximately 2120 students in K-12. Aside from the traditional K-12 classes, the school district also has the Gibson Technical Center, the Strohm Early Childhood Center, and the New Horizons Alternative School. Gibson Tech Center was opened in 1974 and has evolved through the years to better prepare the students for today’s work force. The biggest addition to GTC was made possible through the last bond issue project. Gibson Technical Center is an area career technical center operated by Reeds Spring School District. This institution provides technical programs to meet the needs of high school students, adults and people with special needs. Christian values and character, hard work, and financial responsibility comprise the fundamental building blocks of the 'Hard Work U' experience. At a time when there is much talk about what is wrong with the nation, College of the Ozarks exemplifies what is right with America. College of the Ozarks is committed to its founding mission of providing a quality, Christian education to those who are found worthy, but who are without sufficient means to obtain such training. Instead of paying tuition, all full-time students work campus jobs to defray the cost of education. Upon complete participation in the Work Education Program, the College guarantees to meet the entire cost of education for students, allowing them the opportunity to graduate debt-free. The College openly discourages debt by not participating in any government loan programs and leads by example through having no institutional debt of any kind. Since that time, OTC has continued to uphold a core-set of values that include quality, opportunity, accessibility, learning, diversity, innovation, community, respect, integrity and personal growth. We uphold a mission to promote student learning through accessible, high-quality, affordable workforce training, and technical and general education that is responsive to the educational needs of the community and its diverse constituencies. Technical Education Programs: provide certificates, associate degrees, and short-term programs that enable students to pursue or advance their education. General Education: Provide courses which lead to accomplishment of Certificate, A.A.S. and A.A. degrees. Developmental Education: provide courses which develop basic skills in areas such as adult basic education, reading, writing, mathematics and study skills. Customized Training: provide training to address specific needs of business and industry and further economic development in the region. Continuing Education and Community Service: provide a variety of non-credit courses and lifelong learning opportunities, which are responsive to the needs of the region. Student Services: provide services to assist students in fulfilling their educational goals, including orientation, assessment, advisement, financial aid, personal and career counseling, job placement, accommodation services for students with disabilities, and a library. Their Vision is to be the community's college by providing quality learning experiences that support community, workforce and personal development. Although other taxes have proliferated in recent years, the property tax remains a mainstay of local government finance in Missouri. It provides a major source of revenue for most local governments, and will continue to be important to them. The property tax gives local taxpayers a measure of control over their local governments. Local governments retain a greater measure of their autonomy when they can rely on property taxes. This tax provides a relationship to services received, such as police and fire protection and local streets, although it does so imperfectly. Everyone pays this tax, either directly or indirectly, and its revenues would be very difficult to replace from other revenue sources. More than 2,500 Missouri local governments rely on property taxes. They received more than $3.3 billion in property taxes in 1997. The taxes were levied on an assessed valuation of $54.4 billion, 25% of which was personal property and 75% was real estate. Because of new construction, and increased values, assessed valuations grew an average of 6% a year from 1985, when the first statewide reassessment was completed, to 1997. During that time, taxes levied grew by an average 10% a year. The difference between those percentages is reflective of the tax rate increases adopted by local governments and their voters, and creation of some new local governments. How the Tax Is Determined. The total of the tax rates that have been set by the several governing bodies of local governments where the property is located. In setting values, the assessor is bound by laws and rules designed to assure that assessments are as 'uniform as possible. Once the assessor arrives at the total value of the taxpayer's taxable real and personal property, he/she calculates the portion that is assessed value by multiplying total value by the percentages set in the law for each type of property. Tax rates that have been set by the local governments taxing the property are multiplied by the assessed value and divided by 100. The result is the amount of tax levied against the property. Property is assessed at differing percentages of value according to type of property or its use. The statutes provide that all property improved by a structure which is used or intended to be used as a residence, is to be classified as residential. Agricultural property must be devoted primarily to raising crops, livestock, dairying, etc.